These delicious, high fat snacks are ideal for Low Carb High Fat, Ketogenic, and High Fat diets, and are also a great alternative to fat snacks. 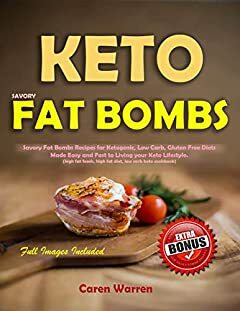 â€œKeto Savory Fat Bombs: Savory Fat Bombs Recipes for Ketogenic, Gluten Free & Low-Carb Diets made easy and fast for Healthy Living your Keto Lifestyle. (high fat foods, high fat diet, low carb keto cookbook)â€ by Caren Warren is pure goodness in the palm of your hand!